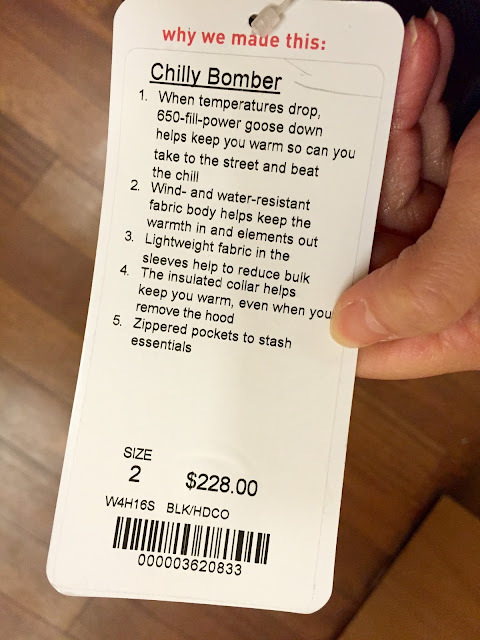 Yesterday I went to the Natick Mall to see if they had the Runderful Pant that's now up on WMTM for $79 marked down from $128. That's a decent amount of savings of almost $50. For reference I'm 4 feet 11 inches. I'm a size 4 in bottoms and fitted tops. 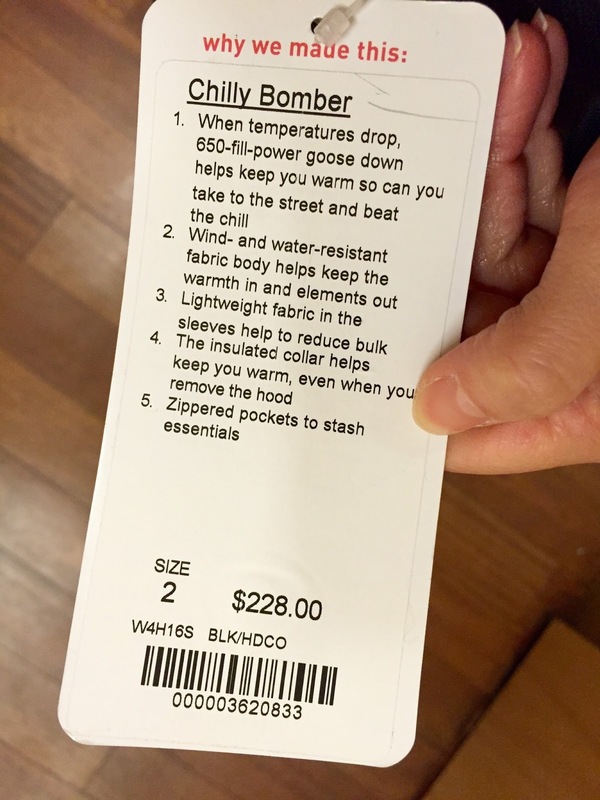 Outerwear I size down to a 2. I tried on my regular size 4 in bottoms, I am almost never a size 2. The lining feels like a pair of Wunder Under tights and the outside is thin and bunchy. Once you get them on, they are pretty comfortable to wear. But I just couldn't get over how clingy the fabric was and how wrinkled and bunchy they looked on me. Maybe I should have tried on a size 2? But I doubt that would have helped much. Super easy pass! I also tried on the Chilly Bomber in black/heathered deep coal. I took my usual size 2. It felt a little bit tight around the arm pit area, and the material on the outside of the jacket is somewhat stiff so I didn't find it too comfortable to wear. It was actually a bit restrictive. I found the jacket to be boxy and straight cut. It was not very figure flattering on me at all. It is lined with 650 fill goose down so it is very warm. The hood is very thick and substantial. Not flimsy at all. The sleeves attract all kinds of hair, dust and lint. If you have a pet I suggest to keep them away from this jacket! The sand/dune heathered ghost might be a better color as long as you have light haired pets! Overall, this bomber is definitely not for me and I definitely didn't think it was worth the hefty price tag. Even on mark down, it wouldn't tempt me at all. One last thing, the fitting room attendants at the Natick Mall are not very helpful. I was waiting on line behind a mother and son for a fitting room. One attendant let the son into the fitting room and then disappeared. Then another attendant came around and asked the mother if she needed any help. The mother told her no, that she's waiting for her son in the fitting room. The attendant then looked at me holding the bomber jacket with the pants and just walked away. Didn't even ask if I needed a fitting room. I had to wait a few more minutes before the first attendant came back to let me into one. Sometimes I wonder if it's because I'm so short, I'm so easily overlooked? This happens to me enough times that it becomes questionable. I thoroughly enjoy reading your reviews, and appreciate your honesty. Yes, the look on your face said it all about the runderful pants! Lol. I'm sorry to hear about the poor service you received in the fitting room. Last year, I frequently encountered a really mean educator. I'm usually not bothered too much, but I felt very annoyed and avoided lululemon altogether for weeks and didn't visit that location for months. When I finally ventured back, another kinder educator noticed me and remarked that she had not seen me for a long time. I told her my reason, and she said there had been numerous complaints made about that educator. That helped a little. And in all honesty, I haven't seen that educator since. Hope yours was an isolated incident. Thanks! I'm glad you're enjoying my blog. I know they're called educators, but most of the time I already know all the things they're telling me! I just kind of nod my head and say thanks. It's kind of funny how they just randomly start talking to you. Thankfully I usually go to the Chestnut Hill one and they're always pretty nice to me there. Let me know if there's anything else you would like to see a review on! Thanks! Unfortunately (or fortunately! ), nothing is really appealing to me at lulu right now. Maybe tomorrow's upload will bring new treasures.